I have been looking at doing a Salad roundup on my blog for ever so long.Well here it is! These are an assortment of my absolute favourite ones. With ingredients like Beets,Olives,Cheese,Chicken,Corn and an assortment of Shredded Cabbage and yes Minced Chicken too,these recipes are sure to complement any dinner table. They are an absolute delight served as main course salads,that work great on week-nights with grilled meats or fish or perhaps just as is with some soup.Our family for one enjoy’s a good hearty salad with every meal. I have put together a mix of some super simple salad ideas.These salads strike a happy balance between sweet and spicy flavours.Most of them have no more than five ingredients along with easy homemade dressings too.Based on what is available seasonally,do go ahead and try some variations if you like.Salads needn’t be boring anymore! Paired with the right dressing they can add that zing to any greens that you may choose.The refreshing choice of ingredients will certainly satisfy your taste buds. Think salad’s are boring? 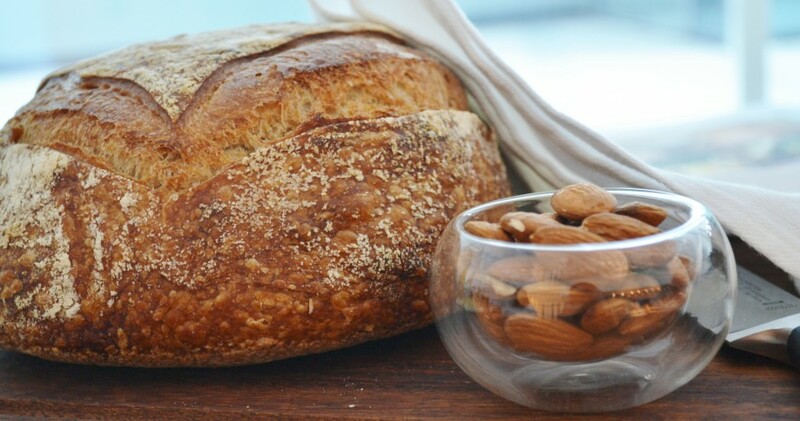 Well think again,as these wonderful recipes are bound to get you to a second helping! Cut the bell peppers into small squares. De seed the cucumber and peel the skin and cut into chunks. Add the above in a bowl and now put in the olives and cheese balls. Mix the Olive oil,salt and pepper with the lemon juice and drizzle over the salad. For the salad, combine all of the ingredients in a large bowl and toss to combine. If serving right away, drizzle the peanut dressing over top and toss; otherwise, serve the dressing on the side so the salad doesn’t get soggy. Add all the above except the chopped coriander to a small food processor and make it into a fine paste.Add the chopped coriander and mix well into the Asian Slaw.Garnish with Sesame seeds and roasted peanuts. Fill a pan with water .Add the chicken breasts and add some peppercorns and bay leaves to it. Bring to a full boil and then lower the heat to a simmer and poach the chicken for about 10 -14 minutes or till cooked. Drain the water and cool. Ensure the water from the yogurt has been drained. Next chop the onions and the green onions and finely chop the capsicum as well. In a bowl now mix the shredded chicken, onions,capsicum and the corn. Mix in the Mayonnaise and the drained yogurt. 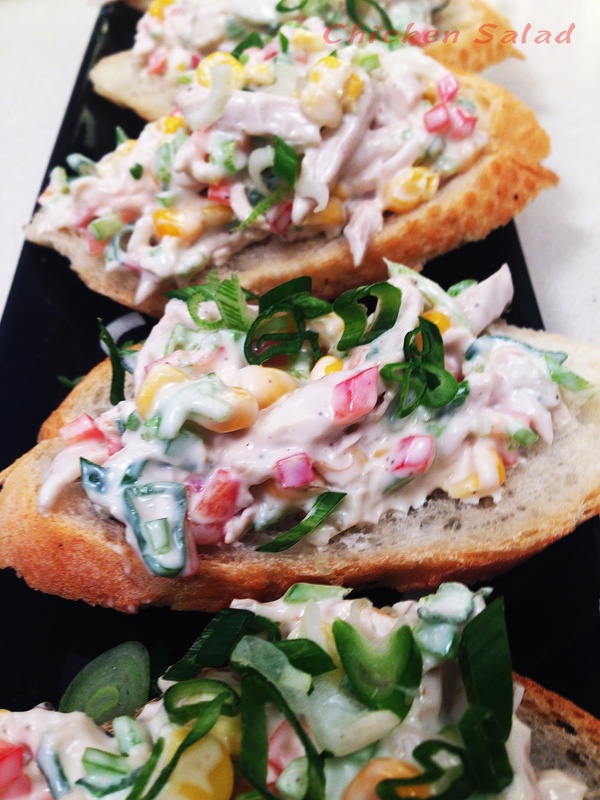 Serve the chicken salad either on some bruschetta or canapés. This chicken salad can be used as a filling for sandwiches or even a wrap. 1.Mix the chopped beetroot & crumbled feta well. 2.Mix all the ingredients for the salad dressing and drizzle over the salad. 1.Fill a large bowl with cold water. Chop off the stem, then cut around the inner core of the lettuce and remove (do not cut all the way through the lettuce; just deep enough to remove the core). Discard the wilted outer leaves and then place the head of lettuce in the bowl of water. Gently pull apart the leaves, then place them on a paper towel to dry. Cut any large leaves in half.Chill in the fridge. 2.Heat the oil in large sauté pan over medium heat. Add the onion and ginger and cook, stirring frequently, until soft, 4-5 minutes. Add the garlic and cook 1 minute more. 3.Add the ground chicken and turn the heat up to high. Cook, breaking up the meat with a wooden spoon, until partially cooked through, about 3 minutes. Add the soy sauce, fish sauce, brown sugar, lemon juice and red pepper flakes and continue cooking, stirring frequently to break up the meat, until the chicken is cooked through, 5-6 minutes more. Off the heat, stir in the scallions, cilantro, mint and nuts. Taste and adjust seasoning if necessary. 4.T0 serve:Scoop some of the filling into the lettuce cup,sprinkle the crushed peanuts and coriander over it add the sliced carrots or peppers and a bit of Thai dipping sauce and roll up and eat . wow…those look great. 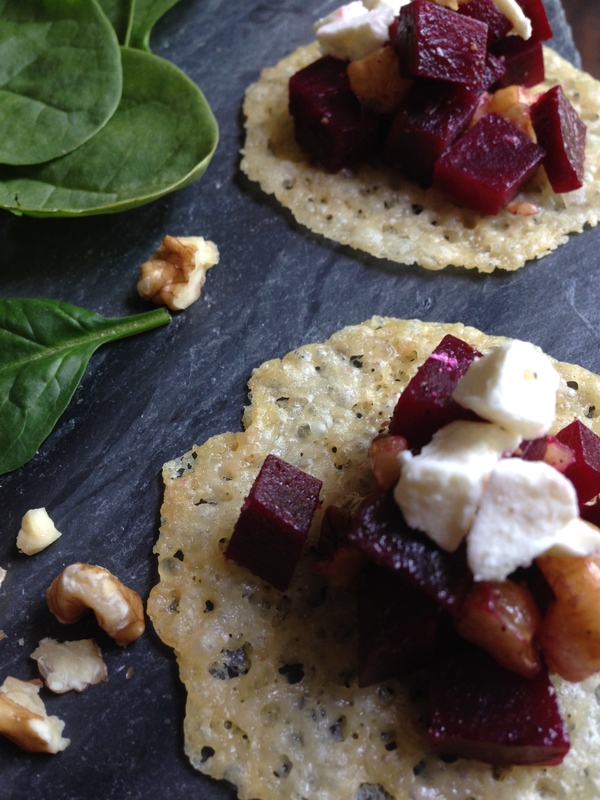 I love the mixture of feta cheese and beet roots. Makes it hard to decide which one to try first. I like the colorfulness of your recipes. Very delightful! wow very nice! Thanks for sharing! I love sweet, spicy and salty! Thank you…yes indeed they are quite a riot of flavours!! Each salad is delicious, love them all. Love your salad round up. 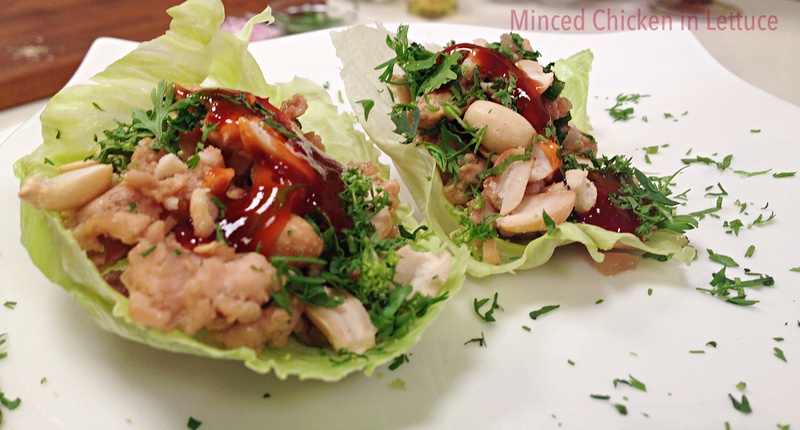 I really am drawn to the lettuce wraps which remind me of Larb, the Thai dish. What a refreshing group of salads! 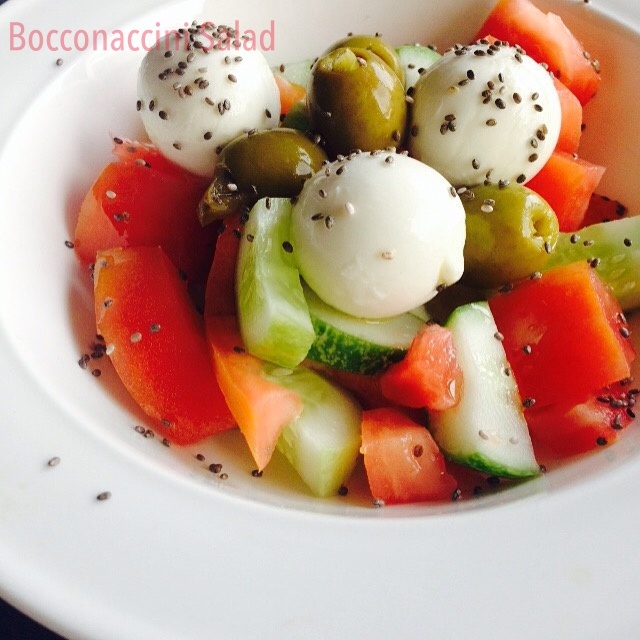 Love these salads– it just what sounds best for dinner on these hot days! 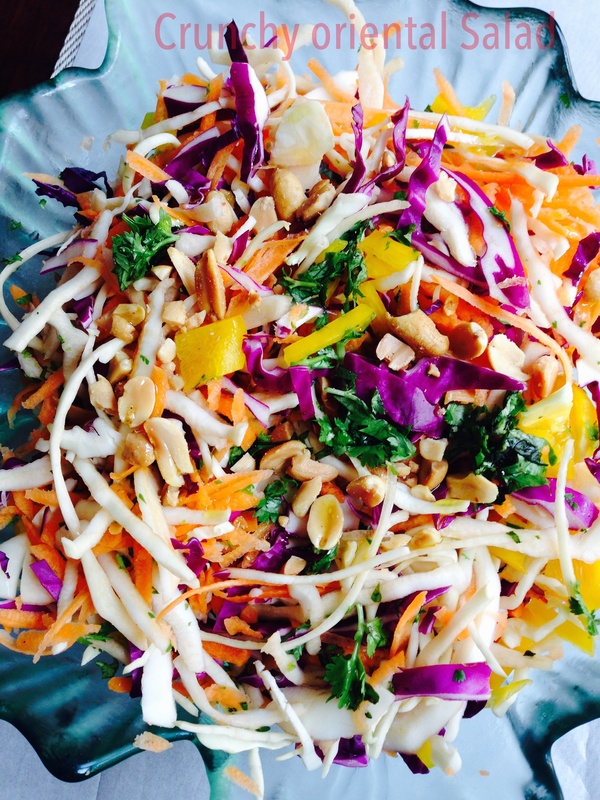 That Asia Slaw is first on my list to try! So bright and colorful! thanks. 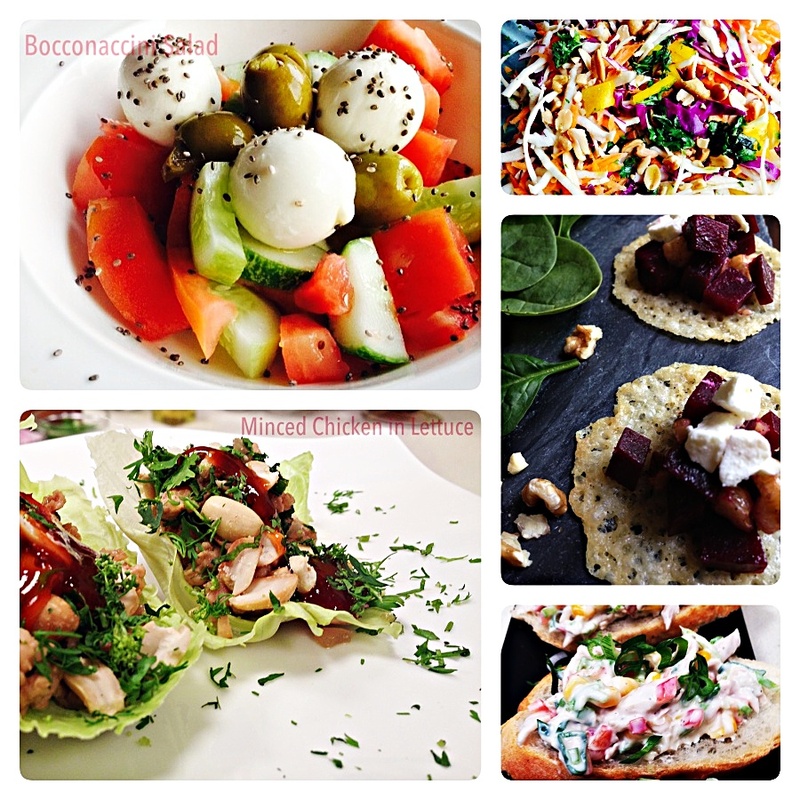 A Delectable Array of Sophisticated Summer Salads by Shy of CookingWithShy! Just Lovely!! These salads look fabulous. I look forward to trying them. All of these salads look so good and your photos are beautiful! so many great salads with crunch here! Healthy and delish. That’s the idea. Will share my results. I’m glad you did a salad roundup. I’m a real salad girl, eating one must everyday and you have some real nice ones here. So beautiful and simple. Thanks for sharing!